AMBASSADOR AMMO AZIZA BAROUD had a conversation as a follow up to the Global Summit on Religion, Peace and Security co-organized by the AIDLR and OGPRtP in November 2016 at the United Nations in Geneva. Following the participation of Ms. Aziza Baroud with a keynote address at that Global Summit on Religion, Peace and Security as member of the Parliament of Chad, when the Deputy of Parliament came back in Chad, she has been called to be the Ambassador and Representative of Chad a Brussels, for Benelux countries, European Union and UK. Dr. Liviu Olteanu met H.E. 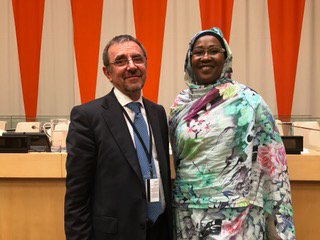 in New York at the United Nations following the Launch of the Plan of Action for Religious Leaders and Actors to Prevent Incitement to Violence that Could Lead to Atrocity Crimes. Dr. Liviu Olteanu talked with Her Excellency Ambassador Baroud on the subject of a collaboration between the AIDLR and the Mission of Chad in Brussels on future projects supporting freedom of religion or belief and organizing together different international conferences and summits.